On Monday, May 8, State Representative Tony McCombie toured ongoing construction of “The Q” in downtown Moline. 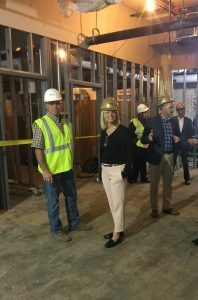 The new Element hotel, being built as part of “The Q” multi-modal station, is on track for an August opening, leaders with Renew Moline learned Tuesday. The new Element hotel which is located at 1202 4th Avenue is being converted from a former Sears Warehouse into a $35 million dollar 96 room extended stay hotel. The steel for the train station’s two-story Grand Hall is expected to arrive next week. The Illinois Department of Transportation’s (IDOT) rail division is in negotiations with the Iowa-Interstate Railroad for an agreement to build the high-speed rail track on the railroad’s property. Negotiations will be done by June and track construction will begin once an agreement is in place, and train service should begin by the end of next year. For more information about “The Q” ClickHere.